I made no secret of the fact that I didn't want to go crazy on Christmas presents for Harrison; at 2 months old he's not exactly going to remember the gifts he receives, no matter how extravagant. I talked about it in depth in a recent post, but essentially, I don't think wasting money on toys, or clothes, or anything else along those lines would be worth doing. I won't lie, the thought of it didn't quite sit right with me - christmas is christmas after all, no matter how little, I didn't want Harrisons' first Christmas not to be a special one. I don't believe gifts are the be all and end all of Christmas, but there is no denying that nowadays - because of that, and because of the twinges of guilt I was feeling at the thought of Harrison being presentless on Christmas morning (not that he'd notice, he will no doubt be in a milk-coma...), I decided to find gifts that could be used for the rest of his early years. The things that make you know it's Christmas. I've found a good few that I've added to my list for Harrison, some of which if I buy this year I'll use for the rest of his childhood, others that I may have to repurchase in years to come. Either way, everything in this gift guide has more sentimental value than a passing trend. Somehow though in my bid to save money I've managed to amass a list that would probably cost more than I'd spend on the latest range of Fisher Price goodies, but at least with these I know we'll be using them for years to come, and not just for the three weeks following. If you've ever watched Zoella, you'll know where I've snatched this idea from. Essentially, in each of the bags was a clue that told you where a gift was hidden within the house. Every day of advent was a new bag, and with it, a new gift. By gifts, it would be xmas themed things that can be done - christmas card materials, bauble decorating, baking supplies, christmas movies, rather than materialistic gifts, all more ways to force my child to love Christmas as much as I do. (Sorry again Harrison...). Every year on Christmas Eve since I was young I was always aloud to open one present - somehow, although I was always told it was completely random, it would always be the same - my xmas jammies. It was just a given that Santa wouldn't come if I wasn't wearing new pyjamas, and I have every intention on convincing Harrison on this fact as well. Much to Jordan's dismay we will all be matching... I'll make sure of it. If anyone knows anywhere that has adult female/male, child size and baby size pyjamas that match, please send them my way - failing that, these ones from the White Company will do the trick. I'd seen these floating around on Pinterest, and I love the idea of having an actual box to open on Christmas Eve. I've got years left to wait, but I want to be able to put his jammies, his letter from Santa, The Snowman book and the classic milk (small carton, not a glass obviously), cookies and a carrot in it for him to open before bed. I guarantee by next year I'll have forgotten this glorious plan, but hopefully buying his Eve box early will let me remember. I expected personalised ones to cost a lot more, but these ones from My 1st Years are really affordable. I want to capture everything at this time of year, and there's something about a Polaroid camera that is much more personal than a quick iPhone snap, although, let's face it, there will be plenty of them too. As much as I'd love the Fujifilm Instax, I don't think I can really justify £55 for just the camera - good old' disposables should do the trick for me. In an ideal world though, this would be first in my basket. My first stocking was Winnie the Pooh, and I loved that thing to death, in fact I still do. Whenever we would hang the stockings up I'd know Santa was coming, and I loved the association. We didn't even use the stockings for presents, I think the best thing that ever came from mine was a pack of AA batteries, but it didn't make them any less special. I'm looking for one that has Harrisons name on it (and whilst I'm ordering his I may as well pick up a few more... it would be rude not to). I don't even have to justify these. They are festive and that's all that matters. I'd looked at personalised ones, but these were around £30 and probably wouldn't have been here in time for Christmas - for now, my £8 Amazon bargain does the trick. 7. Letter From Santa £7.50 Probably premature this year, but I want to be able to save them for every year since he was born for him to look back on - so I'll have to start early. Receiving mail before you hit the 3 month mark... surely that is a record? 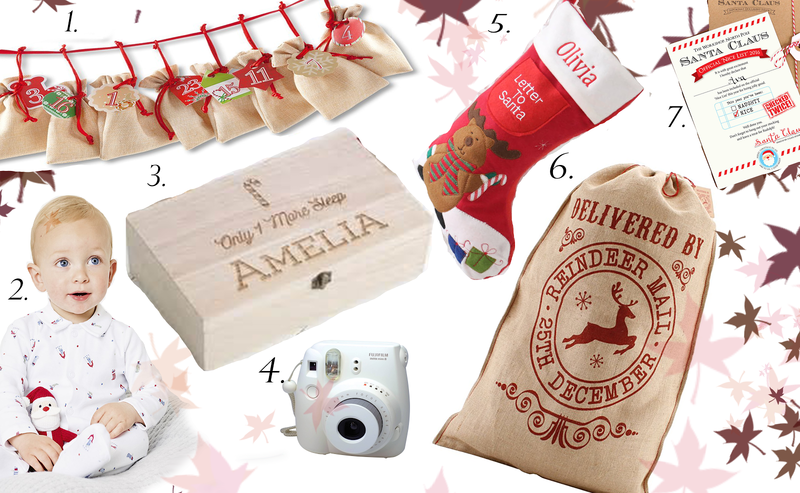 Whilst collating this gift guide, I've managed to somehow click purchase 6 out of the 7 items, so it's safe to say I'll have a haul coming fairly soon. I'm happy spending the money on these things as I know we'll get the use out of them - most of these will be used for years to come, so I don't grudge paying the money for them. Have I missed any memorable presents you's would have bought for your little ones first christmases? Let me know in the comments!